For many years, William McKinley was considered a mediocre President, especially since his second Vice President was Teddy Roosevelt. In McKinley's day and the days and years following his sudden death, he was viewed as a chief executive controlled by his political cronies, a President pressured into a war with Spain by the press. Recent historians have been kinder to McKinley, seeing him instead as a decisive President who put America on the road to world power. McKinley's difficult foreign policy decisions, especially his policy toward China and his decision to go to war with Spain over Cuban independence, helped the U.S. enter the 20th Century as a new and powerful empire on the world stage. 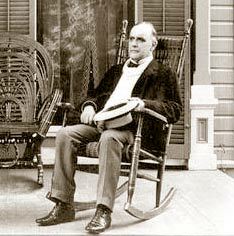 William McKinley, Jr. was born in Niles, Ohio in 1843 as the seventh child of William and Nancy McKinley. 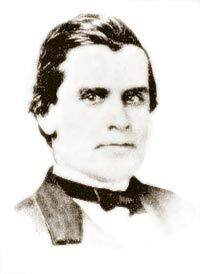 When the Civil War began in 1861, McKinley was 17 years old and teaching in a country school. He enlisted as a private in the 23rd Ohio Volunteer Infantry in the Union Army in which he served throughout the entirety of the War. During the Civil War, McKinley saw service in West Virginia at the battle of South Mountain and at Antietam, one of the bloodiest battles fought during the war. His commander was Rutherford B. Hayes, another Ohioan who would become governor of the state and hold the office as our 19th President. McKinley ran for Congress as a Republican in 1876 and for the next 14 years, with one short interruption, sat in the House of Representatives. As a legislator he was identified with protective tariffs. McKinley believed that high tariffs, by protecting U.S. industry from foreign competition, benefited all segments of society, and his popularity with labor in Ohio attested to his success in wooing wage earners with protective arguments (see protectionism). After losing a race for Speaker of the House in 1889, he became chair of the Ways and Means Committee and architect of the McKinley Tariff of 1890. McKinley lost his House seat in the Democratic sweep of 1890. He was subsequently elected (1891) governor of Ohio and served two terms. An effective state executive, he campaigned widely for national party candidates in 1894, and he left office a front-runner for the 1896 Republican presidential nomination. A Cleveland business executive and close friend, Mark Hanna, helped mobilize support on his behalf and McKinley achieved an easy first-ballot victory. Popular opinion once held that Hanna controlled McKinley, but many historians now believe that, although Hanna's support was invaluable, McKinley was not the businessman's puppet. When the Democrats nominated William Jennings Bryan on a free silver platform, the McKinley forces pressed for continued use of the less inflationary gold standard, endorsement of high protective tariffs on imports, and stressed social harmony in the midst of the economic unrest of the 1890s. Campaigning from his front porch in Canton, McKinley addressed 750,000 visitors, while the well-financed Republican organization, under Hanna's expert direction, distributed millions of pieces of campaign literature that helped insure McKinley's victory. Campaign literature was a new advertising-style campaign technique that revolutionized campaign practices in all future presidential elections. McKinley won the Presidency with 271 electoral votes to Bryan's 176 resulting in the largest winning margin in the popular vote since that of Ulysses S. Grant in 1872. The Presidency of William McKinley, Jr. When McKinley became President, the depression of 1893 had almost run its course and with it, the extreme agitation over silver. Deferring action on the money question, he called Congress into special session to enact the highest tariff in history. His second term would not be completed through a series of tragic events that would change forever how Presidents are protected. Just months into his second presidential term, McKinley -- who had easily won reelection in 1900 -- had made the most significant speech of his presidency the day before, announcing a policy of reciprocal trade agreements with foreign nations to encourage improved markets for American goods. It marked the culmination of a decade-long evolution in thinking for the long-time isolationist and exemplified his statesmanship in recognition of changing times. McKinley's final public appearance in Buffalo was an afternoon reception in the Temple of Music, an ornate red-brick hall on the exposition grounds. Since being elected president in 1896, McKinley had been notorious for discounting his own personal safety at public appearances, and he had repeatedly resisted attempts by his personal secretary, George Cortelyou, to cancel this event. Cortelyou had argued that it wasn't worth the risk to greet such a small number of people, but the 58-year-old president refused to change his mind. "Why should I?" he asked. "Who would want to hurt me?" In spite of death threats made towards McKinley during his presidency, he had been protected by the most casual and primitive security. The president had often walked unattended in Canton and strolled alone on the White House grounds without George Foster in attendance. After his death -- the third presidential assassination in 36 years -- Congress stepped up security for United States presidents by directing the Secret Service to add the protection of the president to its duties. Two years later, Congress enacted legislation that made presidential protection a permanent Secret Service responsibility. On the west side of the Ohio Statehouse in Columbus, is a statue of McKinley, looking west. When William McKinley was governor of Ohio he lived in a hotel across the street from the capitol building, called the Neil House. His wife, Ida, would sit at the window of their room and watch him cross High Street and make his way up the main walkway to the Statehouse. Before he entered the building each day, William would turn and wave to his wife. Each year on his birthday, a bouquet of scarlet carnations (the Lamborn Carnation) is placed at the base of his statue in honor of his life-long service to our state and our country, both in times of war and peace. McKinley National Memorial - over 100 years ago, communities across the nation donated their pennies to help build a spectacular monument to President McKinley. That monument is located on McKinley Monument Drive Northwest. this 26-acre national landmark is dedicated to the 25th president William McKinley, who is entombed there along with his wife and two children. The patio of the monument provides a fine view of downtown Canton. "War should never be entered upon until every agency of peace has failed; peace is preferable to war in almost every contingency." Note: Just over 1 year later, the United States was at war with Spain.